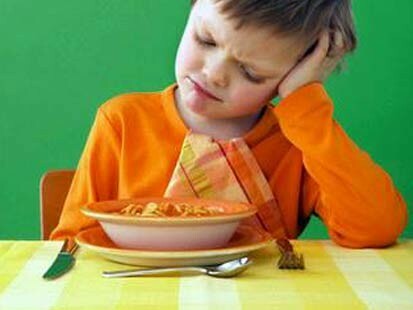 Children are picky eaters–it’s normal. In the past, children would have eaten junk food if it were available–but it just wasn’t widely available. Fast food restaurants are not to blame. Society, which expects parents to work 60-hour weeks, is to blame. In American society, where we have no maids or help at home, nor extended families to help out, fast food and pre-prepared food (which can just be reheated, or served as is from the store container) is the solution to a time-crunch problem (see Part I of of this series). What’s different today, from in the past, is that with the proliferation of junk food everywhere, parents at home and nutritionists at school have basically given up trying to force children to eat healthy food. Gone are the rules of sitting at the table until vegetables are eaten, or (proper portion sized) plates are cleaned. 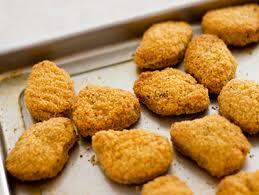 Package of chicken nuggets, which can just be opened and reheated. Chicken nuggets aren’t even real pieces of chicken, which is why children complain if parents try to make them at home using real chicken. (In fact, as Jamie Oliver demonstrated to children, they are made out of pureed chicken scraps (mostly skin, fat, and a tiny bit of meat) left over on the carcass after all the meat has been cut off. They are an invention of the food processing industry to see how much money can be salvaged from the last bit of waste. Parents no longer have the time or energy to make or enforce such rules, much less to cook fresh vegetables from scratch. But sadly, most of these children are not even being served the delicious frozen vegetable combinations that children of the 60s and 70s grew up with. It seems that family meals are now a thing of the past in the majority of households. With everyone “grabbing what they can on the run,” or “eating whenever they feel like it on different schedules,” as well as everyone working on their own computers in different rooms, family mealtime doesn’t even exist in many homes any more. 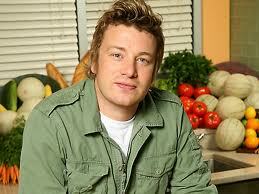 British Chef Jamie Oliver, known for making fresh produce accessible to all. When I saw Jamie Oliver’s School Dinners, which showed children in England who didn’t know the names of common vegetables (such as potato and tomato) I just couldn’t believe it. 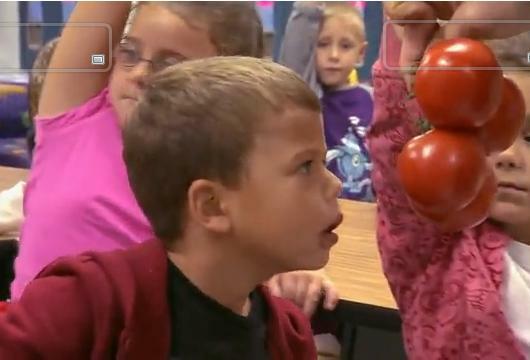 But to my surprise, in his next program, Jamie Oliver’s Food Revolution, Jamie came to America and showed us American children who did not know the same common vegetables! But all of these children knew what French Fries and ketchup were–they just didn’t know anything about potatoes and tomatoes. English Chef Jamie Oliver, who emphasizes fresh produce and its health benefits, showed us both British and American school children who did not know what tomatoes and potatoes were. In America, in the 1960s and early 70s, we still had healthy, well-balanced lunches at school. These were all planned on a monthly basis, and published in advance so everyone could decide whether to eat the hot lunch, or bring a lunch from home. Let’s take a look at those lunches. All included a protein, a green vegetable, sometimes a yellow vegetable, a fruit, a roll (bread), and a dessert. The green vegetables were sometimes cooked spinach, cooked green beans, cooked peas, or something similar. The typical fruit was a few pieces of canned apricot, canned peach, or canned applesauce. Sometimes the desserts were two cookies, and a brownie. Students went through one cafeteria line, and everyone was served the same healthy lunch. Pizza might be served once a month, and hot dogs might be served once a month. Those were very popular days. Macaroni and cheese might be served twice a month, and red spaghetti with meatballs might be served twice a month with a small bit a fresh salad. The only drink given was a small carton of milk, and once a week, students were given the choice to have chocolate milk. While this is a modern lunch tray in a school which obviously cares, I’m certain that the majority of kids drink the chocolate milk and eat the taco, while throwing away the rest. This was true in the 60s and 70s, and it is why so many schools have done away with trying to serve things that kids won’t eat (vegetables and fruits). So what actually happened to these lunches? Did students eat these healthy lunches? Not generally. The meat or chicken and mashed potatoes with gravy,were generally eaten. A few kids ate the canned fruit, but more threw it out. Hardly anyone touched the green vegetables because canned green vegetables generally do not taste good, are overcooked, and often stringy, and canned spinach is pretty disgusting. some kids ate the fresh salad, but more did not. So roughly 50 percent of the food was thrown away into the bins every day. 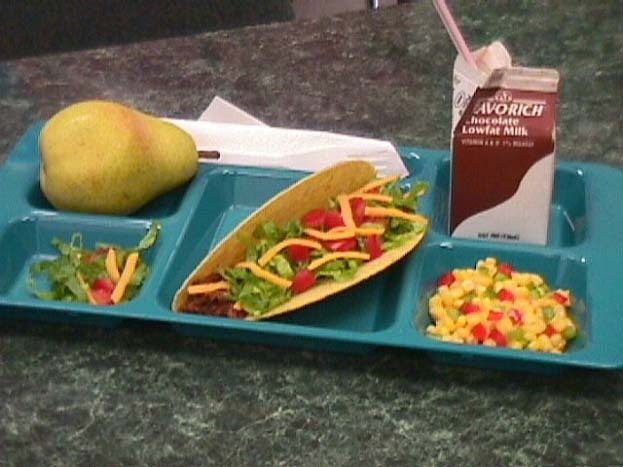 Parents and school districts lamented all the wasted food, as well as the cost of all of it. Were we taught about nutrition in those days at school, and at home? Of course we were. Most mothers were cooking healthy, balanced meals and teaching their children about the four food groups, as well as pointing out those groups on the plate when they were served. 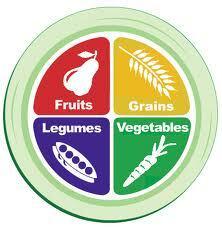 Most people were eating properly-sized servings at home and remained at a healthy weight. The four food groups, as taught in the 1960s and 1970s. Families went to a nice restaurant about once or twice a month, and to inexpensive or fast-food restaurants no more than twice a month. No one bought pre-prepared food at supermarkets, in fact, supermarkets did not yet sell that. Many mothers did use frozen vegetables, which were of higher eating quality than canned vegetables. But more people ate canned vegetables because they were cheaper. The generation before that, most people were still canning vegetables at home in winter, and fresh produce in summer. I still remember my mother talking about growing up in Colorado during the 1930s, where getting ONE orange in the Christmas stocking was considered a worthy gift from Santa Claus. Fresh fruit was still expensive and rare, especially during winter. By the 60s and 70s, few people were still doing that. Those who could afford it began using high-quality frozen foods to reduce food preparation time, and those who could not afford it ate canned vegetables. Fresh foods were available, but they were not in as wide variety as they are today, and they were always expensive. Did all of this make us eat our vegetables at school, or even like them? Of course not. Because of the disgusting quality of the canned green vegetables at school, many people got turned off green vegetables for life. 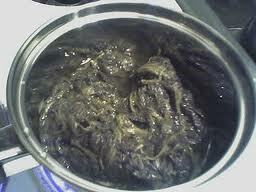 Cooked spinach, served directly out of a can on a lunch tray is disgusting to most people, particularly children. When I was four, I was a very picky eater and refused even to eat things like steak. Only by the time I was in high school did I come to appreciate the good-quality foods my parents forced me to eat at home. In those days, the concept of “children’s foods” and “adult foods” did not exist. Children were served, and expected to eat, the same foods as adults. Many children of today never learn to appreciate these good, fresh foods. Most children are picky eaters, and if left to their own devices, will always choose a junk-food diet. The difference is that when that junk food is not available anywhere, most children do eventually learn to appreciate healthy foods. The problem with many of today’s children, as exemplified in the television program Jamie’s School Dinners, which can be seen HERE, is that with today’s proliferation of junk food, adults have given up and started serving children the junk food they crave–not as an occasional treat, but as their regular fare. 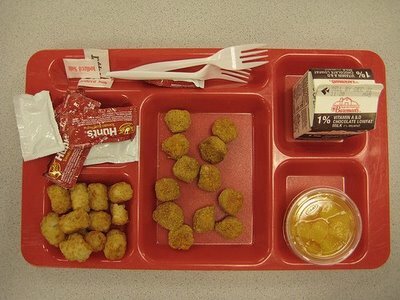 Unhealthy lunch tray that many kids crave. Typical school diets in England of pizza and chips (French Fries), according to a nutritionist who analyzed the meals, lack even minimal vitamin C and iron; these diets also promote heart disease, diabetes, and cancer,” she says. All the problems being treated in the National Health Service come back to what we are feeding our children.” This means that they will most likely never learn to appreciate good food, and wind up with poor health in middle age, as a result. This is happening in America, this is happening in England, this is happening in the third world. It is even happening where I live now, in North Africa. In North Africa, in the upper-middle-class school where I taught, where students bring lunches from home, parents often send healthy lunches, including salads with many fresh vegetables and even three or four pieces of fresh fruit. However, many other parents send white bread and french fries, sometimes with cooked ground beef, a whole sack or can of potato chips (crisps), sugary drinks, and a whole sack of cookies. Most of the kids who eat like the latter are overweight, and of course share their junk food with their friends. So many of the kids bringing healthy lunches don’t eat their healthy food (a few do) and instead eat the junk food their friends bring. Before 1999, this junk food wasn’t even available, but with the first supermarkets opening, a much wider variety of processed products became widely available. Now that many more women are being educated and working outside the home, they no longer have time to make the home-cooked meals typical of North African cuisine, especially in the larger cities. So what is to be done? If families care for the health of their children, they should make an effort to prepare home-cooked meals at least a few times a week. 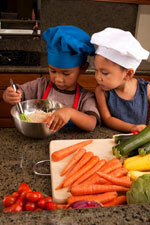 Most importantly, YOUNG children (starting at age two or three) need to be INVOLVED in the food preparation. Teach children how to help prepare vegetables while they are still young enough to be interested. Yes, it’s trouble for the adults, but this is the age (before 7) when they are interested and want to listen to their parents’ ideas. By age 8-9 it’s the very last chance. By age 10-11, peer pressure has completely taken over. It’s too late. They will only be interested in assisting you to make their favorite junk-food dishes. At preschool ages, they love learning about fruits and vegetables, and different ways to prepare them. Make the most of this chance if you have young children. If you give them an appreciation for good food when they are young, even if they later go heavily into junk food, they will come back to an appreciation of good food in their 20s, as they have money to start enjoying nice restaurants, and as they start their own families and think about the health of their own children. Teaching Cursive Part 5 (of 25): Which Form of Cursive Should I Teach? Teaching Cursive: Part 1 (of 25) --What NOT to Do! When Did "Social Studies" Replace History and Geography in American Education? What Happened to the Narrative Method of Teaching History?